LET THE GAME TEACH YOU! Rocket City 3on3 is a league for the players. Kids need to enjoy playing the sport to want to improve. FUN is our league's key focus! Here is an opportunity for players develop basketball skills in a fun, low-stress environment. Healthy competition in which kids play hard and play to win but not at the expense of belittling opponents, yelling at officials or displaying poor sportsmanship. We ask that players conduct themselves appropriately and exhibit good sportsmanship. We ask the same of parents and others who come to watch. Adults, please set a good example for the players. We know sometimes it is difficult to refrain from "coaching" the teams during play. Certainly some of the younger teams may need help with rules and subbing, but please do not be coaching during play. Let the kids play and figure out some things on their own. So many players have told us they love to just play and know they aren't going to get yelled at! What does RC 3on3 look like? We do accept Schedule Requests prior to making the Schedule. Rocket City 3on3 is a league for the players. Kids need to enjoy the sport to want to improve. Our league's key focus is FUN! This is an opportunity to develop basketball skills in a fun, low-stress environment. 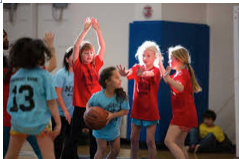 We encourage healthy competition in which kids play hard and play to win but not at the expense of belittling opponents, yelling at officials or displaying poor sportsmanship. We ask that players conduct themselves appropriately and exhibit good sportsmanship. We ask the same of parents and others who come to watch. Adults, please set a good example for the players. We know sometimes it is difficult to refrain from "coaching" the teams during play. Certainly some of the younger teams may need help with rules and subbing, but please do not be coaching during play. Let the kids play and figure out some things on their own. So many players have told us they love to just play and know they aren't going to get yelled at! No coaching. cheering, however, is encouraged. No swearing, taunting or other inappropriate verbal or physical behavior. Unsportsmanlike play can result in: 1) warning; 2) 2-minute sitting out; (ref discretion) and/or 3) ejection from the game, the evening or the entire league (site director discretion). Games are 20-minute running time. Time outs are not allowed. Unlimited substitution after made baskets or when ball is not in play. All players need completed liability waivers signed by a parent on file in order to participate. Subs are not allowed to play without this waiver on file also. Scoring: 2 points per basket inside the arc. 3 points per basket outside the arc. Bonus Free Throws: One shot (worth 2 points) will be given to a player fouled on the fifth foul and all subsequent fouls by the opponent. There is no double-bonus. Intentional fouls (no matter the time of the game) will result in 2 points PLUS the ball. Players have 6 seconds to shoot a free throw once the teams are lined up. 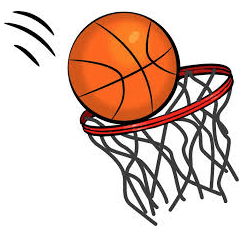 Following a made basket or dead ball, the other team can check the ball in anywhere behind the arc. Both feet and the ball must go outside of the 3-pt line at a change of possession. A ball that goes out of bounds under the basket is checked in behind the arc. The half-court line is out of bounds. Defense gets all jump balls. 3 seconds in the lane. Refs will issue reminders. Excessive violations will result in a turn-over. A defensive rebound must be taken past the arc (this includes air-balls). There are no "free backs". No stalling. There will be a ref’s discretion 30-second shot clock. Failure to shoot in a 30-second period will result in loss of possession. No dunking during warm-ups or games. This may result in game or league ejection of player. "Rock, Paper, scissors" (RPS) will determine which team gets the ball first. The court monitor assigned to your court will monitor PRS, ref your game, keep score, and record the outcome with the official scorekeeper. Ties will be settled with a sudden death free-throw shootout. Each team receives equal opportunities to shoot free throws until one team makes one and the other misses. New shooter each time. League shirts should be worn. At the end of the games, it is good sportsmanship to shake hands with your opponents. Please, pick up your garbage and help put chairs away at the end of the event. Help to keep the facility clean. Case Study – According to Statista.com*, 20 million people plus participate in basketball each year in the US. There are countless choices of camps, clinics trainings and teams/clubs for basketball players to choose from. When a parent is choosing for their child, cost, time commitment, location, expected player development, quality of coach/instructor and the enjoyment their child may have. The rise in popularity of 3 on 3 format is quickly rising. ALL player touch the ball more. In 5 on 5 players can go several minutes without touching the ball or be involved in a play. Join us and learn more about this exciting new program.